Michael Bourada is full-time professional magician, performs over 200 shows annually and has over 17 years of experience; he's undeniably become one of the leaders among Ottawa Magicians. Michael is the perfect solution for Birthdays, Company Events, Schools/Camps, Fundraisers and more. With a show that is truly original, interactive, modern and incorporates live animals, you will not be disappointed with the high quality magic he proudly provides! Want something different at this year's event? Experience the Magic of Michael Bourada! Chris Pilsworth, a full-time professional magician based in Ottawa has been providing magical entertainment to audiences for over twenty years. Hes been called engaging, original and unexpected. Youll soon agree - he was "Born To Amaze"! Elliot Smith has entertained corporations, television audiences and travelers across Canada, the United States, Europe, the Caribbean and Mexico for over 38 years as a professional magician. Prime Ministers of Canada, International Ambassadors and even the late Liberace have experienced Elliotts special brand of Magic and Comedy! Magic birthday parties are directed to children from 4 years of age and up. All the magic is very visual and uses characters that the children can relate to such as Kermit the Frog. During the show, the children are assisting the Magician. There is a special trick at the end for the birthday child, they are made a balloon animal and given a framed diploma honoring them as a certified Magicians Assistant. Its their special day, leave them with a memory not soon forgotten. FAB the magician offers dynamic magic shows in Ottawa and Gatineau! FAB is fully bilingual too! FAB offers professional entertainment for your corporate event in the Ottawa-Gatineau region. 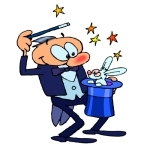 He can be your M.C., perform stage magic or walk-about magic, adult magic shows as well as magic shows for kids, big and small, FAB does it all! 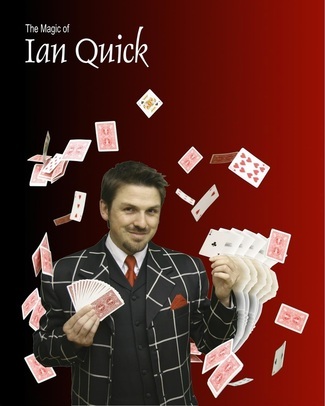 "Ian engages the spectator on a personal level and capivates their attention with witty delight. He leads them to an astonishing, intense, and humorous culmination that reaches far beyond the wonder of the magic itself."